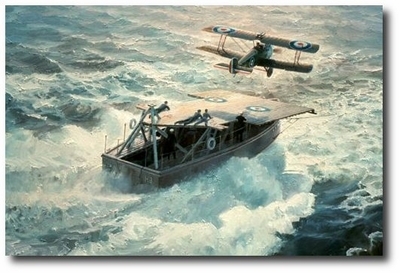 Flight Sub-Lieutenant Stuart D. Culley in his Sopwith 2F.1 Camel is just airborne after a five foot run on the deck of a barge being towed at approximately 35 knots by the destroyer HMS Redoubt in the North Sea. It is August 11, 1918 and Culley's mission is to intercept Zeppelin L.53 which is approaching the British fleet at an altitude above 18,000 feet. 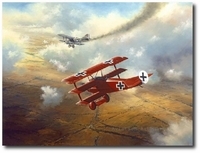 After an hour's climb, Culley destroyed L.53 which was to become the last Zeppelin lost during World War I. Culley returned to the Redoubt, landed alongside and was recovered with the aircraft.